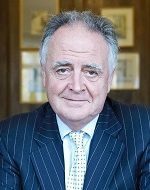 Peter Hambro, Chairman of Peter Hambro Ltd., the mining finance business that he founded 28 years ago and which gave birth to Peter Hambro Mining PLC (now Petropavlovsk) has been involved in the financial world for more than 50 years. Starting his commercial life as a banker at his family’s Hambros Bank in the City of London, he moved to the world of precious metals in 1979, with Mocatta & Goldsmid. Here he was involved in the buying, selling, borrowing and lending of gold, silver and platinum with central banks, investors, miners, jewellers, industrial users and many others. This business included mining finance, which led him to mine ownership and, amongst others, to the founding of Petropavlovsk which has now produced more than 10 million ounces of gold in Russia. He was a director and shareholder of Kazakhstan-based, Bakyrchik Gold at the time of its Listing on the London Stock Exchange. In 2017, after an acrimonious dispute with Petropavlovsk’s activist short-selling bondholders, Mr Hambro returned to Peter Hambro Ltd., where he s still involved in mine ownership and mine finance; always as a principal. Why did I choose Russia as a place to develop a world-class gold mining project?